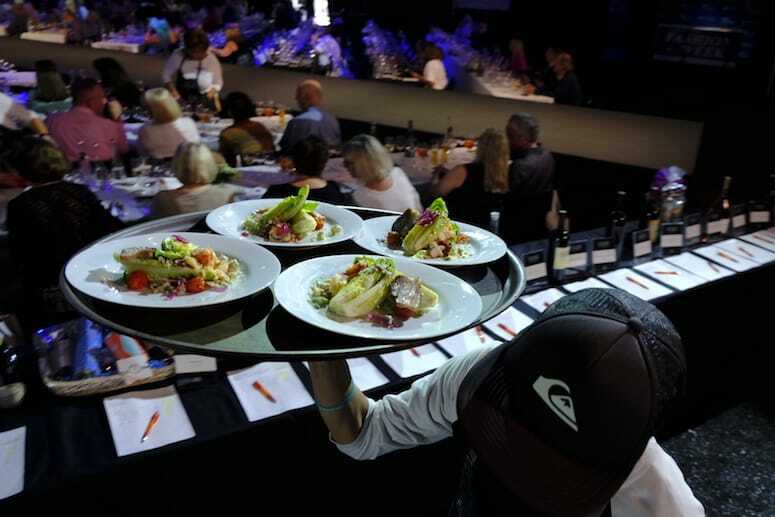 The event opens the weekend-long Palm Desert Food & Wine festival and benefits FIND Food Bank. 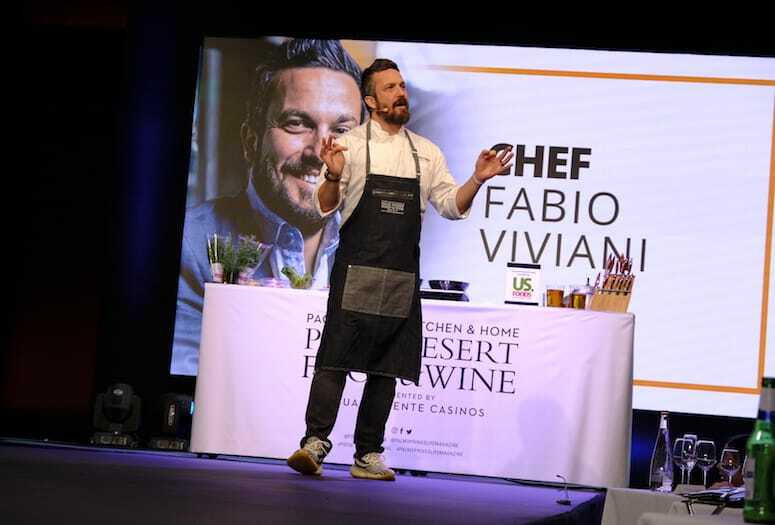 Chef Fabio Viviani talks to a full house at the James Beard Luncheon to open Palm Desert Food & Wine, March 22 in Palm Desert. The four-course James Beard Luncheon, helmed by four celebrity chefs whose collective credits include Top Chef, Chopped, Beat Bobby Flay, and others, was, in true desert style, laid-back and more than a little loose. • For tickets to Sunday’s Grand Tasting, click HERE. Chef and author Stuart O’Keefe, the emcee whose numerous costume changes were a nod to local fashion fave Mr Turk, set the tone for the two-and-a-half-hour affair by asking, “Are we drunk yet? No? Why not?” And glasses began to tip at the long tables situated on each side of a long catwalk. 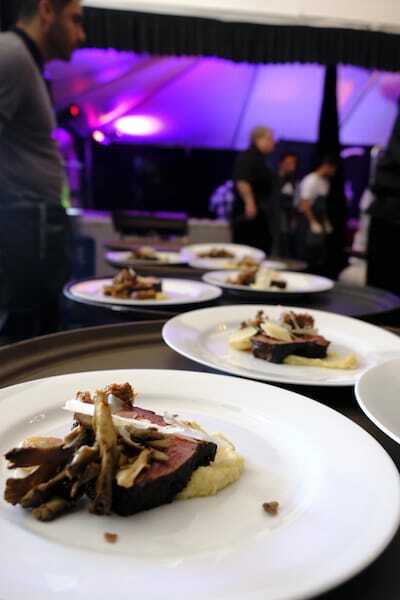 The chefs prepared each course at a cooking station near the head of the catwalk, flanked by giant screens. Chef Fabio Viviani’s starter, “a spin on a wedge salad,” made magic with baby lettuce wedges dressed with dollops of Gorgonzola cheese, a chunk of crispy bacon, and spirals of buttered lobster. 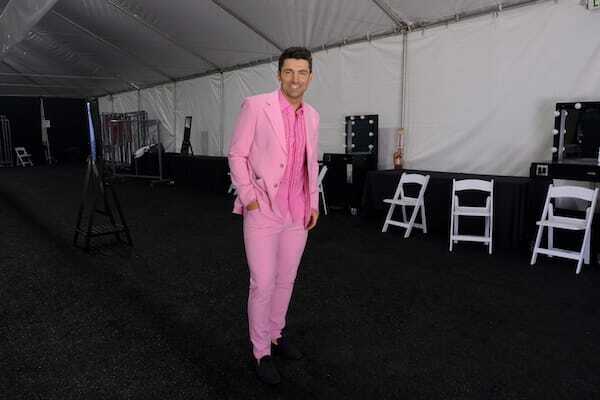 Chef Stuart O’Keefe opened Palm Desert Food & Wine’s James Beard Luncheon in this pink suit. The fresh black truffle dressing offered an earthy hint to perfectly contrast the light acidity of charred cherry tomatoes. The wow factor: a warming, pungent cracked black pepper hit at the end. All complemented by a tingly prosecco. Chef Fabio Viviani’s put a new spin on a wedge salad with baby lettuce wedges dressed with dollops of Gorgonzola cheese, a chunk of crispy bacon, and spirals of buttered lobster. L.A. chef Antonia Lofaso dialed up Viviani’s turn toward Italy with an on-the-money egg yolk dense ravioli stuffed with (among other ingredients) mascarpone cheese, peas, and fresh marjoram. As she added a chunk of butter to the element that elevated this dish, an earthy mushroom broth, she joked, “Butter is the new kale.” What made it all a medley of sweet, savory herby, and organic was the topping, scattered fresh English peas and sautéed pea tendrils. This dish had the bite, flavor, and aesthetic pop that made you want to pack your bags for the old country. 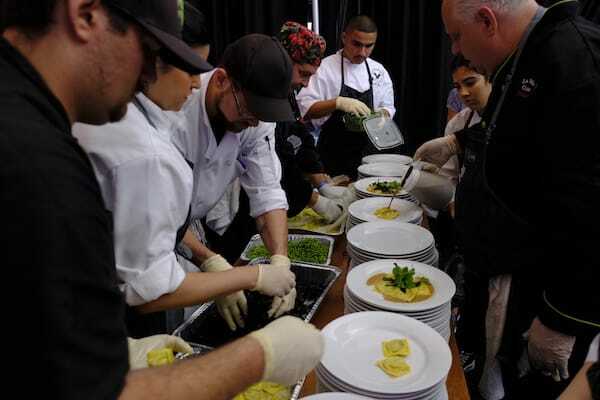 Workers prep chef Antonia Lafaso’s egg yolk dense ravioli stuffed with mascarpone cheese, peas, and fresh marjoram. Scott Conant’s sweet onion and spice-crusted sirloin appeared deceptively simple to prepare but yielded complexity in flavor. “It all starts with the way I cut the sirloin down the middle, so there are two ‘loaves,’ and then constantly braise while cooking.” He did this with a sauce of maitake mushrooms and oxtail. While the Lombardelli Barbera d’Asti wine balanced the richness of the dish and the fat of the cut, the showstopper was the velvety parsnip purée. Conant spilled the secret: “I don’t use dairy in my purées. Keep it light and simple.” A base of shallots, olive oil, and kosher salt did exactly that. 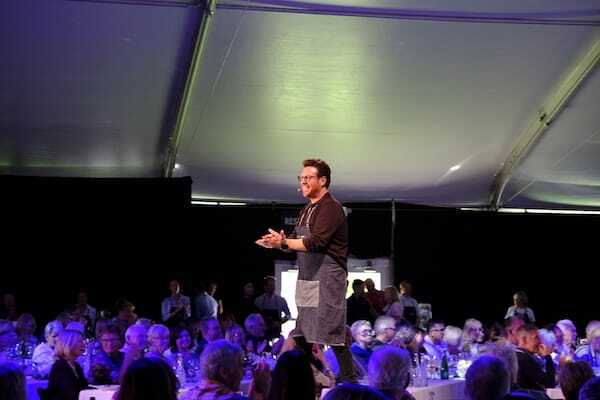 Chef Scott Conant engages the James Beard Luncheon audience from the runway as they feast on his main course of sweet onion and spice-crusted sirloin. Zac Young began by strutting the length of the catwalk shirtless under a plaid Mr Turk full romper. From there it was an easy, liquor-slicked slide into what defined his negroni mousse: booze. “After a big sirloin, you don’t want a sugar bomb. Plus, negronis are one of my favorite cocktails, so why not a dessert?” A healthy portion of his beloved beverage went into the custard-based concoction that got its depth with the addition of melted white chocolate. The so-glad-I-stayed-for-it bonus was the topping, a marcona almond crumble, almost like a super chunky granola, but oh so toasty, slightly sweet, and perfectly crunchy. 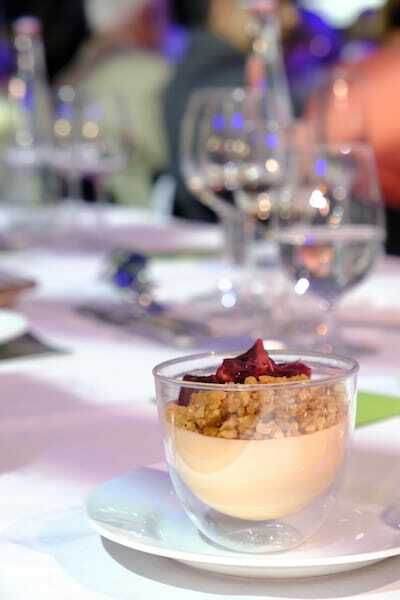 Zac Young’s dessert included melted white chocolate and was topped with marcona almond crumble. Palm Desert Food & Wine continues Saturday and Sunday with a robust schedule of grand tastings, chef demonstrations, and more. Visit palmdesertfoodandwine.com. The Fab Five celebrity chefs from the James Beard Luncheon included Zac Young, Scott Conant, Scott O’Keefe, Antonia Lofaso, and Fabio Viviani. VIDEO: Watch the James Beard Luncheon at Palm Desert Food and Wine from start to finish here. For livestreams of every runway show, go to palmspringslife.com/livestream.